LOUSIVILLE, KY--(Marketwired - March 19, 2014) - Churchill Downs Racetrack today announced the opening of public nominations and voting for participants in the 2014 Survivors Parade Presented by Kroger, and a new partnership with Bright Pink®, a national organization that focuses on the prevention and early detection of breast and ovarian cancer and while providing support for high-risk individuals. The Survivors Parade is part of the sixth annual Pink Out festivities held in conjunction with the 140thrunning of the Longines Kentucky Oaks - America's premiere race for 3-year old fillies on Friday, May 2. On April 1, the 140 survivors will be invited to be the guests of Churchill Downs for the 2014 Longines Kentucky Oaks and to participate in the Survivors Parade before the race. In recent years, survivors participating the in the parade have come from 27 states. For the annual Pink Out, the historic race track will be decked out in pink bunting and the 100,000-plus guests attending the Longines Kentucky Oaks are asked to wear pink to show their support. As part of the 2014 Pink Out and Survivors Parade, Churchill Downs Incorporated (CDI) Foundation announced a $50,000 donation to launch a six-week fundraising program to benefit Bright Pink and its national breast and ovarian health programs. 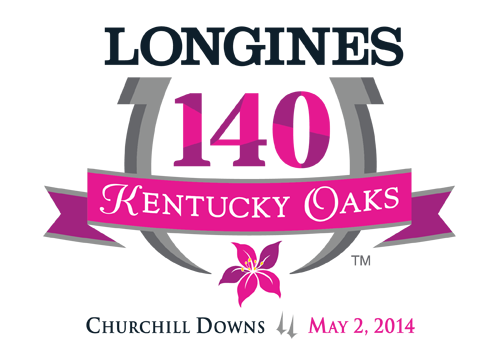 The company will also donate a portion of each Grey Goose Oaks Lily®sold during the Pink Out to Horse and Hopes, a local breast cancer initiative that benefits people working throughout Kentucky's horse industry. The fundraising program concludes on Sunday, May 4. "The Pink Out has become an important tradition at Churchill Downs over the past several years and we are pleased to be able to include a major fundraising program that gives our company, business partners and racetrack guests an opportunity to support Bright Pink's efforts to overcome the two of the most deadly of women's health issues, breast and ovarian cancer," said Ryan Jordan, general manager of Churchill Downs Racetrack. Churchill Downs became actively involved in breast cancer awareness in 2009 when one of the company's long-time employees, Tricia Amburgey, was diagnosed with stage 3 breast cancer. "Although she eventually lost her battle with cancer this past year at the early age of 42, the strength and courage Tricia displayed over the past five years serves as an inspiration to all and motivates us to do what we can to prevent others from suffering the same fate," Jordan said. During the 2014 Survivors Parade, Churchill Downs will pay a special tribute to Tricia Amburgey, who was a fixture at the racetrack for more than two decades. "It is our hope that through education, prevention and treatment we eventually no longer have a need for a Survivors Parade," said Jordan. Any breast or ovarian cancer survivor is eligible to be nominated to participate in the 2014 Survivors Parade, and nominations can be made by the survivor themselves, family members or friends online at www.kentuckyderby.com/survivors. Once a nomination is published, then friends and family are encouraged to vote for the nominee to be selected to walk in the parade. Voting is limited to once per day. Nominations and voting will continue through Monday, March 31 at 11:59 p.m. EDT. The 140 survivors will be announced on Tuesday, April 1 and will receive two tickets to the 140thLongines Kentucky Oaks and will be invited to participate in the 2014 Survivors Parade on Friday, May 2. As part of the 2014 Pink Out activities, Churchill Downs is partnering with Bright Pink®, the only national non-profit organization focused on the prevention and early detection of breast and ovarian cancer in young women. Founded in 2007, Bright Pink empowers women to be proactive with their breast and ovarian health to reduce the risk of developing these diseases, or to detect them at an early non-life-threatening stages. "Bright Pink is so grateful to be a part of the Longines Kentucky Oaks in 2014," said Lindsay Avner, Bright Pink Founder and CEO. " To have the opportunity to spread our message of breast and ovarian cancer prevention and early detection on such an international stage is invaluable and will undoubtedly have a tremendous lifesaving impact." $50,000 Donation by Churchill Downs - Churchill Downs will kick off the Pink Out fundraising program by making a donation of $50,000 to Bright Pink through the Churchill Downs Foundation. Survivors Parade Presented by Kroger Donations - As part of the nomination and voting process for the Survivors Parade, the public is encouraged to make a donation to support Bright Pink programs. Donations can be made in the name of nominees at www.kentuckyderby.com/survivors. Longines Kentucky Oaks Day Donation - Guests attending the Longines Kentucky Oaks will have an opportunity to make a contribution directly to Bright Pink as they enter the track on Friday, May 2, at a series of donation stations manned by volunteers wearing Bright Pink shirts. Each guest making a donation receives a pink lapel ribbon in return for their support. vineyard vines 30% Donation - As the "Official Style of the Kentucky Oaks and Derby," vineyard vines will donate thirty percent of proceeds from the sale of four Pink Lilies printed items in its vineyard vines for Kentucky Derby collection to Bright Pink. The Pink Lilies pieces include a tie, bow tie, pocket square, and tote bag. These items and your complete vineyard vines for Kentucky Derby collection will be available for purchase starting March 23 online at www.vinyardvines.com, vineyard vines retail stores, select retail partners, and through the vineyard vines site at Churchill Downs. $1 Donation from Oaks Grey Goose Lily Sales - For the sixth year, Churchill Downs will donate $1 from each Grey Goose Oaks Lily® sold on Kentucky Oaks day on Friday, May 2, to Horses and Hope. Over the past five years, Churchill Downs has donated nearly $500,000 to breast cancer organizations as part of its annual Pink Out. Churchill Downs, the world's most legendary racetrack, has conducted Thoroughbred racing and presented America's greatest race, the Kentucky Derby presented by Yum! Brands, continuously since 1875. Located in Louisville, the flagship racetrack of Churchill Downs Incorporated (NASDAQ: CHDN) also operates Trackside at Churchill Downs, which offers year-round simulcast wagering at the historic track. Churchill Downs will conduct the 140thrunning of the Kentucky Derby on May 3, 2012, and its Spring Meet is scheduled for April 26-June 29. The track has hosted the Breeders' Cup World Championships a record eight times. Information about Churchill Downs can be found on the Internet at www.churchilldowns.com. With a $1 million guaranteed purse, the Longines Kentucky Oaks is the most lucrative American horse race for 3-year-old fillies, and the third most attended day of racing in the U.S. - only after the Derby and Preakness. Twenty-six Oaks winners have gone on to be crowned with an Eclipse Award as North America's champion 3-year-old filly. The purse reflects the Oaks' status and importance as a sports and entertainment event. The race has attracted crowds in excess of 100,000 in 13 of the last 14 years, including an unprecedented 116,046 in 2010, and set wagering records in 2013 with more than $14.2 million bet on the race and $45.5 million bet on the entire Oaks card. Bright Pink® is the only national non-profit focused on the prevention and early detection of breast and ovarian cancer in young women, while providing support for high-risk individuals. It is on a mission to reach the 52 million young women in the U.S, between the ages of 18-45, who have never been diagnosed with breast or ovarian cancer and encourage them to be proactive - to reduce their risk for these diseases or detect them at an early, non-life-threatening stage. Bright Pink seeks to educate, equip and empower women through innovative programs and tools such as it innovative Brighten UPTM Educational Workshops and our digital Assess Your Risk tool and to encourage at-risk individuals to see their doctors at least once a year. To learn more or become involved in Bright Pink go to www.BrightPink.org. Founded in 2008 by Kentucky First Lady Jane Beshear and the Kentucky Cancer Program, Horses and Hope helps provide breast cancer awareness, education and early detection and treatment referral in Kentucky's horse racing industry. Utilizing its pink stable of volunteers, the organization focuses on programs at Kentucky's four thoroughbred race tracks to provide education and outreach for race fans and track workers. This is the sixth year Churchill Downs has donated a portion of Grey Goose Oaks Lily®sales to the charity. Kroger, one of the world's largest retailers, employs more than 375,000 associates who serve customers in 2,640 supermarkets and multi-department stores in 34 states under two dozen local banner names including Kroger, City Market, Dillons, Jay C, Food 4 Less, Fred Meyer, Fry's, King Soopers, QFC, Ralphs and Smith's. The company also operates 786 convenience stores, 320 fine jewelry stores, 1,240 supermarket fuel centers and 38 food processing plants in the U.S. Recognized by Forbes as the most generous company in America; Kroger supports hunger relief, breast cancer awareness, the military and their families, and more than 30,000 schools and grassroots organizations in the communities it serves. Kroger contributes food and funds equal to 200 million meals a year through more than 80 Feeding America food bank partners. For more information please visit kroger.com. Kroger's Louisville Division operates 98 stores in Kentucky, southern Indiana and southern Illinois. vineyard vines®, a company best known for its whimsical neckties and smiling pink whale logo, was founded in 1998 on Martha's Vineyard when brothers Shep and Ian Murray cut their ties with corporate America to start making ties that represented the Good Life. In addition to signature neckwear, vineyard vines offers a variety of clothing and accessories for men, women and children. Products are sold in over 600 specialty and department stores worldwide, through a seasonal catalog at (800) 892-4982, online at vineyardvines.com and at over 40 freestanding stores.